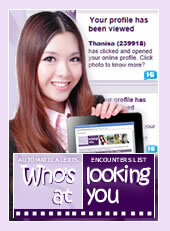 Saowanee (422711) describes herself as Easygoing, Outspoken and Warm hearted. Her outlook on life is Ambitious, Independent and Unconventional and her goals are Family, Career and Fame. She likes to hang out with Country folks, Entreprenuers or Cultured people and she enjoys eating Thai, Health foods and Sea food food. She prefers to listen to Dance/disco, Easy listening and Dance/disco music. Her main hobbies include Cards, Reading and Travel and her favourite sports are Hiking, Body shaping and Badminton.